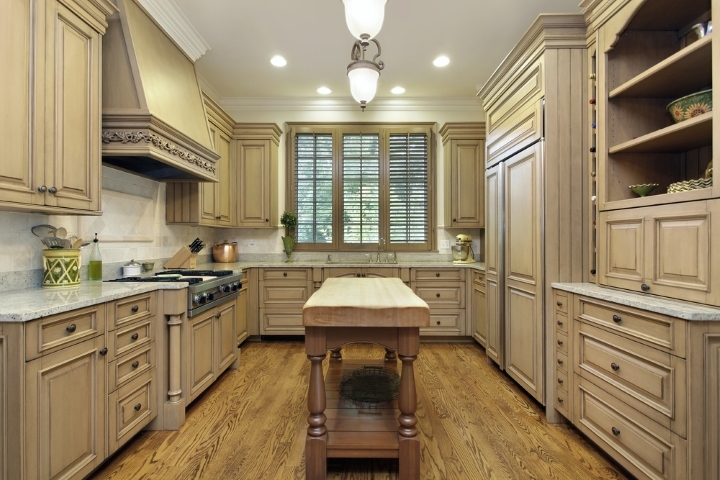 You have probably heard the phrase “the kitchen is the heart of the home” time and time again. It is a statement proudly proclaimed in the opening words of the majority of interior design articles. The reasons for this are because it couldn’t be truer and because it gives testimony to the importance of the kitchen. Practical, contemporary kitchen design is, in this day and age, essential to a well-functioning home. Days begin and end in the kitchen. It is here that we get what we need to go about our day, and here where the most important activities in life begin. But if the kitchen is the heart of our home, it is the kitchen island that keeps it beating. Today, kitchen islands are far from a difficult acquisition and by no means is a huge space required to accommodate one. Kitchen islands come in all shapes and sizes, and with all manner of accessories and adaptations. But how do you make sure that this important centrepiece is being utilised to its maximum potential? Here, we guide you through optimising your kitchen island so that you can be sure you are making the most of such a fabulous feature of your home’s interior. 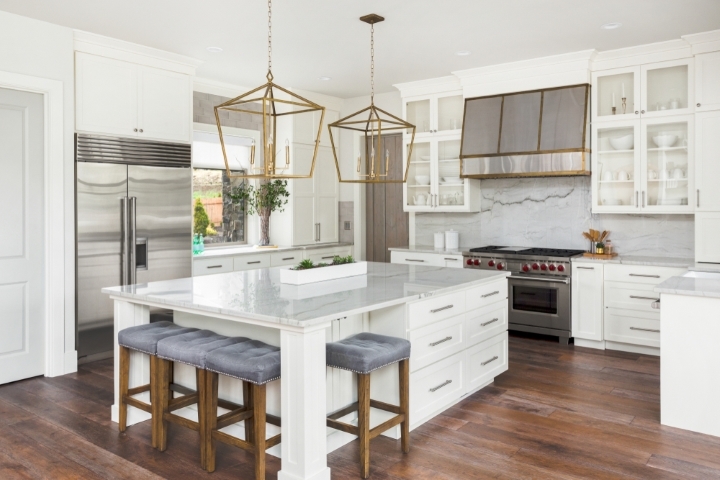 Getting the maximum potential out of your kitchen island begins with identifying how it functions in your kitchen and what can be added to fit your needs. What will your kitchen island be used for and how frequently? Does it function as a social space? What is the seating potential? Can it be a surface that accommodates for preparing food and eating breakfast but can also be used as a workspace? An essential tip is to build your kitchen island in alignment with the ideal kitchen design concept. This is the idea that your kitchen is made up of three vital points. These points represent movement between cooking and preparing food. Therefore, these three points are the stove, sink and refrigerator. When these key kitchen features form a triangle, you have a layout that is efficient for all kitchen tasks. It is important that your kitchen island does not hinder this layout, so you must instead decide which point your kitchen island will accommodate. 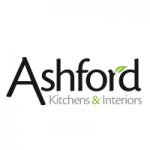 Having analysed your kitchen island’s function and purpose, you then need to assess its shape, size and surface. There are a couple of principal rules to abide by when optimising your kitchen island and its position within the kitchen. Firstly, make sure that your island is at least four feet from any other kitchen counter. If it is doubling up as a place to socialise or dine, you might want to consider a space larger than four feet, but use this as a minimum distance. Secondly, remember that the minimum ideal height for a kitchen island that best suits your need is 36 inches high – any lower and you’ll risk ergonomics and practicality. Aside from remembering these rough dimensions, the rest is up to you and how your kitchen island fits into your kitchen. 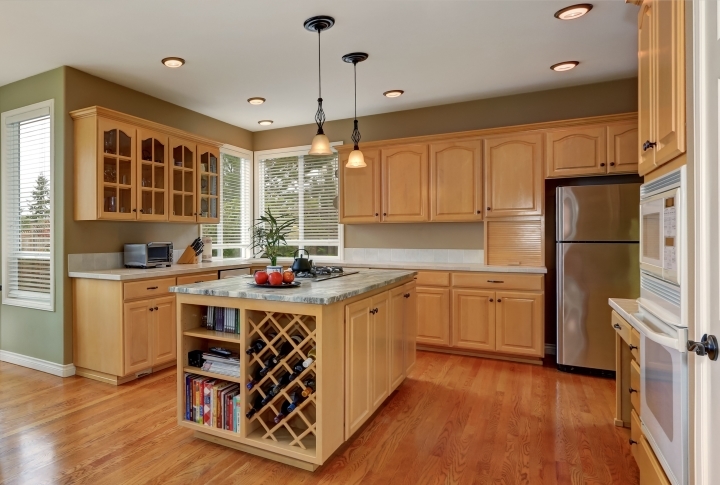 The shape is usually a very basic equation, but make sure that you allow room for potential cabinets and drawers or any other functions your kitchen island may serve. Size has partially been covered by the first rule, but having a comfortable amount of space to walk around your kitchen island is crucial. This needs to be carefully measured alongside the space you need on your kitchen counter. If your worktop will double up as a social or dining space, make sure you have the right size to allow for a comfortable level of footfall and adequate surface space. The surface is another variable and the price range for kitchen island counters is incredibly wide. 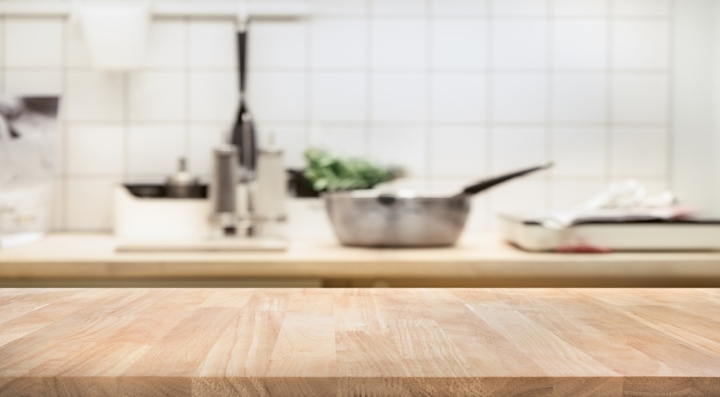 If your kitchen island is going to act primarily as a counter for chopping and preparing food, you might even want to consider a wooden worktop. Wooden surfaces like butcher block countertops are a staple, especially for a farmhouse-style kitchen. Wooden kitchen islands with wheels can be light but efficient – they provide a manoeuvrable yet versatile surface and can even be made more versatile with a drop-leaf top. Wooden surfaces do, however, require annual maintenance to protect from stains and damage, but any ageing will at least give it more character and a stunning patina. Stone, quartz and marble worktops, on the other hand, are more common for larger kitchen islands and offer a space for having breakfast or doing some evening work. Depending on size, they can also create an impressive social space. These worktops also have the benefit of being very durable and requiring very little maintenance. They do tend to be a more expensive option, but as an investment that will last for years to come, it might present the most cost-effective choice over the long term. A kitchen island makes for a beautiful centrepiece in your kitchen, but you must remember that it is not just a pretty face. A huge advantage of having one is the number of opportunities it provides. Underneath your kitchen island is an abundance of space that can be utilised in many different ways. Extra cupboards and drawers are probably the most common use of this space, but make sure to use this area to the best of its ability depending on how you use your kitchen and the space you already have. If your kitchen is in need of extra storage space, you can optimise your island by adding carousel units, deep cupboards or even pull-out bins. If you’re already on top of storage, you have many other stunning kitchen design ideas available. Open shelving creates a space to house your favourite novels and cookbooks, and looks tidy yet decorative. A wine rack is another potential installation that, again, adds a decorative yet functional touch to your kitchen island. Taking the time to select the size, shape, material, interior and everything else that goes into your kitchen island can often lead you to forget to look up! You shouldn’t neglect your overhead space. How you accessorise your kitchen island to bring the best out of this space will depend on the style of your kitchen. For a farmhouse-style kitchen, a hanging rack can work beautifully. 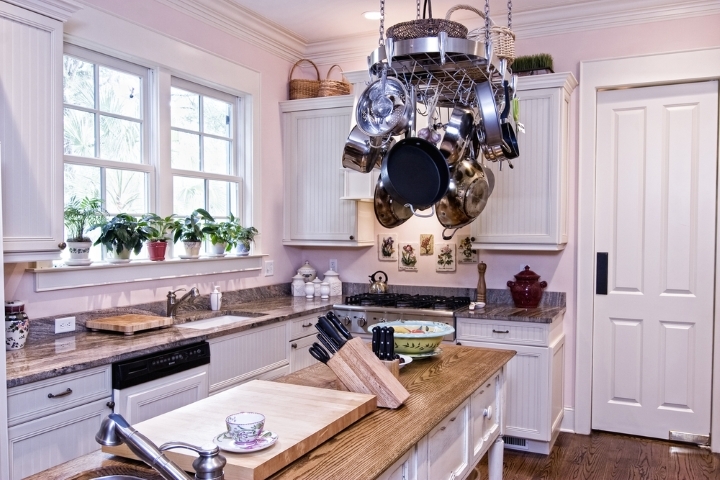 Pots, pans and other utensils can hang from above a kitchen island in a space that would otherwise be wasted. This frees up space in cupboards and drawers while also adding a homely touch to your kitchen. For a more contemporary design, overhead lighting is a functional option. This puts your kitchen island in the spotlight for complete clarity while cooking and preparing meals, while also serving as the perfect place for the kids to do a spot of homework. Previous story Small business funding and property: have you considered an SSAS pension?